You are here: Home / Blog / Uncategorized / Vacant Properties = Motivated Sellers! Vacant Properties = Motivated Sellers! Every profession has tools of the trade, products which help us get ahead in our industry. Thanks to innovative technologies, investors now also have a fantastic tool to zero in on neglected properties. Find Motivated Sellers is a new product that can help investors locate vacant homes around the country or right in their own backyard. Created by entrepreneurial investor Chris Richter, who partnered with veteran industry leader Kent Clothier, the software is helping many sophisticated buyers find their deals. In fact a loyal reader in San Francisco, Jimmy Tu, a master wholesaler and rehabber, was able to land three vacant property deals in less than three months utilizing the Find Motivated Sellers system. I recently had the pleasure of interviewing Chris and Kent so they could explain this exciting new technology and how it can benefit more of our readers. Linda: Tell us a bit about the Find Motivated Sellers Now system. How did it come about? Kent: Find Motivated Sellers Now is the product of necessity and data insight. In 2008, co–founder and creator Chris Richter embarked on a three month research mission to uncover insights in the property data that would act as an early indicator that a property had a high likelihood of being sold at discount. One glaring indicator associated with many of the deeply discounted sales, as well as those that sold quickly, was that they were vacant. Linda: What are some of the benefits to using Find Motivated Sellers Now? Chris: The benefits are time and money. The platform is designed to allow any user, regardless of experience, to log in and, quickly and easily, create and distribute marketing to a highly targeted list. It’s quick and easy, with just a few clicks of a button. Due to the list being targeted to an audience with a far higher likelihood of turning into a seller, the ROI is increased dramatically. Linda: Tell us about the partnership you formed for this new marketing tool. 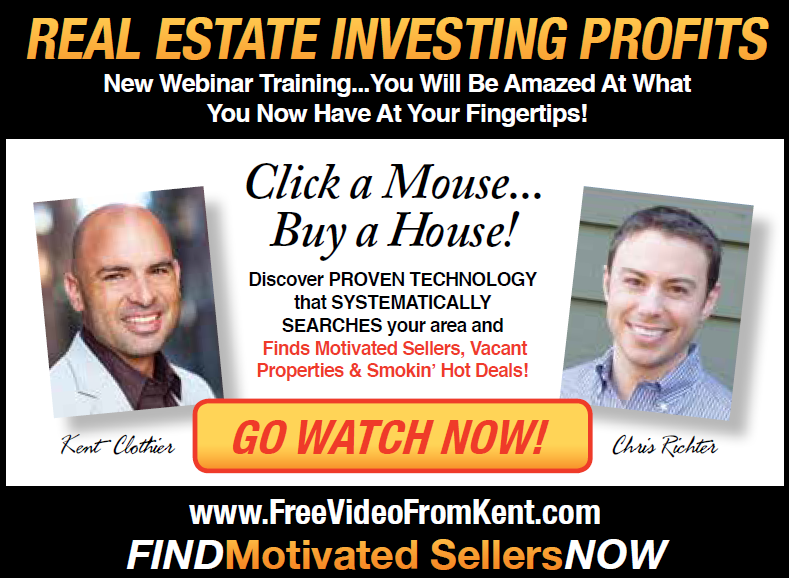 Chris: I reached out to Kent Clothier in November of last year and demonstrated how I was using this method to find highly motivated sellers, off market. Despite being in a market with one of the tightest inventories in the country, I was able to effortlessly locate phenomenal deals. Linda: I like that a mailing campaign can be executed directly from the system, which makes marketing easy to do. Can you please discuss that further? Kent: The system is designed to be dropdead simple to use, even for folks who are not tech savvy. Users can simply log in, click their state, county, or city, then run a search based on their criteria. Investors can zero in on vacant homes, vacant commercial, high-equity properties, etc. From there, users can export to excel or simply mail directly from within the system to their list. It is the built in simplicity and functionality that really makes it such a powerful tool. Linda: Why are vacant property owners a great audience to zero in on? Chris: Vacancy is what we call a leading indicator of distress. What the numbers tell us is that although not all vacant properties have distressed owners, most distressed home sales are vacant. What makes it the most profitable among lists for direct mail is the fact that the property is generally vacant before it is an REO, before it is probate, before it is listed, before you see a lien, etc. The vacancy is typically the first warning sign that someone may need to sell soon. Previously, this list wasn’t publicly available. Linda: Why do good homes end up being neglected and abandoned? Kent: Homes become vacant for many reasons, not all of these reasons would make someone want to sell. Some common themes we see in vacant homes where people do want to sell include: pre–probate, family member moved to nursing home, eviction, seller moved out of area, rental vacancy, death with no probate, and even an occasional jail sentence. Linda: What other insight can you add that investors can learn from? Kent: Don’t be afraid to mail more and do extra marketing, it will make your phone ring. Linda: Does your system have sample letters that can be used? Does it also provide phone numbers? Chris: Yes, the system includes letters for both investors and brokers that have been tested repeatedly and proven to work well. Again, this is a push-button system, we have done all the heavy lifting for you. Once a user has set up their account, they are literally a couple minutes, and a few clicks away, from having proven copy in the mail and out the door. We do not provide phone numbers, we want them to call us. Linda: How can we learn more? Chris: Readers can see our demonstration on www.FreeVideoFromKent.com Thanks and let us know how it goes.